There is a rabbinic tradition that Abraham and Sarah were so welcoming that they would leave their tent open on all four sides in order to welcome strangers. [1.] So it always amuses me when Rabbanite Jews discuss which Jewish thoughts are not welcome in their modern tent. Just this week, Rabbi Jack Abramowitz wrote a very good and thought provoking piece on who is “in the tent.” And today, I invite him into my tent, even though he won’t welcome me into his. Let me first start by saying that the Jewish world is too small for us to be acrimoniously divided. We don’t have to agree on everything (or on anything for that matter); but wherever humanly possible, we can welcome all Jews into our tent. That’s why I’m a bit perplexed by Rabbi Abramowitz’s views as to who is the tent and who is left out in the cold. You mention the Karaites. This movement dates back to the 9th century. It was preceded by such movements as the Sadducees and the Boethusians, which date back to the time of the second Temple. What all these movements have in common is that they reject the Oral Law. According to Orthodoxy, acceptance of the Oral Law is an inherent religious belief. A movement that teaches otherwise cannot be accepted as just another approach. It’s outside the tent. In the year 1039, Karaites and Rabbanites participated in a communal Purim event in Ramla. Nothing says “one-big-tent-with-everybody-in-it” like a joint Purim party. In the twelfth century, Rambam accepted the Aleppo Codex as being the authoritative copy of the Tanakh. The Aleppo Codex was written by a Karaite. In the 1950’s as Egyptian Jews were suffering increasing anti-Semitism and were fleeing the country, the Rabbanite Jews of Egypt ceased all aliyah activity for 1 month until the Jewish Agency gave the order that the Karaites would be allowed to make aliyah as well. This is one of many reasons that I have professed Rabbanites to be awesome. And just a few months ago, I featured a great conversation with my local Chabad Rabbi about the Karaite approach to Yom Teruah and Sukkot. There is no historical or even philosophical reason that the Jewish tent cannot include both Karaites and Rabbanites. The only reason to exclude a historically Jewish movement from your tent would be if you thought your tent could not withstand open and honest discussion about the Torah and how it applies to our lives. That is, you would only exclude Karaites or Rabbanites or Essenes or Pharisees or Sadducees if you think your tent is not strong enough to weather the ensuing debates. I cordially invite Rabbi Abramowitz to have a meal with me in my tent. I’ll even abide by his standards of kashrut for the meal. I know my tent is strong enough. And I know the tent of the Jewish people is strong enough. And I know my tent is the tent of the Jewish people. [1.] Here is a short explanation of the origins of this tradition. [2.] As you might presume, I deny the premise of the question. 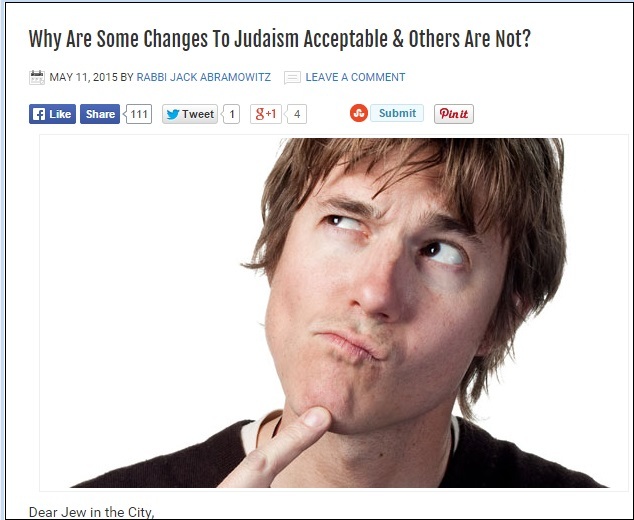 I don’t think that Karaite Judaism “changed” anything. Rather, Karaite Judaism and Rabbanite Judaism both arose in response to a change in the Jewish world: the destruction of the Temple and the fall of the priesthood. This is a topic for another day, though. [3.] He states, “Orthodox Judaism is a bigger tent than most people think.” This might suggest that he is only talking about the Orthodox Jewish tent. But he then continues, “There’s more than one way to look at things and more than one way to get things done. I was raised reform but it never spoke to me.” Reform is clearly outside the “Orthodox” tent – but Rabbi Abramowitz does not state that they are outside the tent. This leads me (and many others) to understand that he is talking about who is in the Jewish tent in general. Interestingly, many reform Jews deny the Oral Law (and even the divinity of the written law). It’s a very Orthodox blog. For what it’s worth, I think the Rabbi did not mean to speak for all of Judaism, just Orthodox Judaism. Also for what it’s worth, he doesn’t speak for all Orthodox Jews in defining even that tent. All of these movements, in my opinion, have serious weaknesses, both intellectually and spiritually. We live in an age where such affiliations are outdated and counter-productive. Why bother defining what a Jew is. They didn’t back in the old days. In today’s world, where we are surrounded by so many other nations and ideas, we would be better off tossing these ‘movements’, unifying under one umbrella, and actually thinking for once in our long and storied history about what is really important and what value we truly bring to the world. Yes; and to clarify I love Jew in the City. The Karaite Jewish community needs something like it. But presently our numbers are too thin. Thanks for sharing your thoughts. For clarity, I only address the stated question of why Orthodoxy accepts some innovations and movements as legitimate alternatives but not others. This is not a statement as to whether a movement or an individual adherent is Jewish, just whether Orthodoxy considers the movement an equally-viable alternative within the bounds of halacha (Jewish law). For example, when I was Reform, I was just as Jewish as I am now. Reform Judaism is definitely Jewish. But my Reform friends know that I cannot attend their services because they do not conform to halacha as I understand it. I have seen comments on other blogs around the web to the effect that the “Rabbinic” understanding of Karaism is incorrect. I don’t know how the Karaite movement evolved since its earliest days, so I feel unqualified to comment on the state of modern-day Karaism. You certainly consider the movement to be Jewish and I’m not trying to take that away from you. (The only movement that calls themselves Jewish that I deny are stealth missionaries posing as Jews.) The practical difference is that if an Orthodox friend told me that he was considering Karaism, I could not support that decision because, like Reform, it’s not in keeping with halacha as I understand it. I hope this clarifies the intent of the article. And if you happen to be in New York City, I’d be delighted to join you for a meal at a kosher restaurant. I have atheist friends, Muslim friends, Hasidic friends, and Catholic friends – I can always use a Karaite friend or two. I don’t have to agree with everybody’s theology! Thank you for your thoughtful response. Please count me among your Karaite friends. If you need anything Karaite, please consider me a resource, and if I am in NY, I would be happy to join you for a meal. Qabalah, which is pagan magic(k) and idolatry culled from a few foreign religions in Jewish drag, does not square with “proper” Rabbinic Judaism, has infested much of Rabbinic Judaism and should very much be outside the Orthodox tent. One of the kinds of damage it causes is that it gives an impression that Judaism approves of idolatrous concepts; as a consequence, it is even used by Christians for excuses to justify their idolatrous beliefs and claim by the way that we have no grounds to complain about their non-biblical additions. We are quite sorry that you and many other Orthodox rabbis believe that Qabalah deserves to be in your tent. Kabbalah is a complicated issue. That thing that lay people go to classes in? The thing that Madonna was into? That’s not kabbalah. That’s just some people who gleaned some basic ideas from kabbalah sharing them with others. It’s superficial at best. To think that one could actually learn anything substantive about kabbalah that way is like preparing for one’s physics dissertation by watching Cosmos. Kabbalah can only be learned by someone who has mastered everything else – Bible, Talmud, Jewish law, Jewish thought, ethics, philosophy, etc. Without the prerequisite background, they won’t begin to scratch the surface of understanding what’s going on. I can read a textbook on neurosurgery and think I understand it but if I never took biology, anatomy & physiology, organic chemistry, etc., I really don’t. There are great rabbis who have profound knowledge and understanding of kabbalah but such people are exceedingly rare and they didn’t get their knowledge at adult education classes. What the masses call kabbalah isn’t the real deal. As noted in the original article, I am more of a rationalist, so kabbalah isn’t really my flavor, but I felt the need to address the general acceptance of (real) kabbalah. The pseudo-kabbalah popularized for mass consumption is somewhat frowned upon. Orthodox Jews are likely to go to Torah-study classes on a wide variety of subject but kabbalah is not typically among them. As a orthodox convert I have always wondered about this. In my personal opinion, there was, and always will be something good in every part of the different Jewish movements, from Chasidim to Haredim, from Reformed to Orthodox. We can each learn something from the other groups, but to my very best understanding and EXPERIENCE, the tent of the Orthodox community is not that open. You either accept this or that or nothing. There are no room for a different interpretation. The only time the tent is open, is on Yom Teruah (Rosh HaShanah) and Yom kippur, because then you need to pay for your seat, and the orthodox shulls are all to eager to lay there hands on there money. What a much better “Am” will Israel be, when we can learn to stand all together – but obviously the fact that we worship the ‘One God’ and proclaim it twice a day, doesn’t count in making Israel one. Here in Israel they even say that if you don’t wear a velvet kippa, that you are not even Jewish……My question is, who is accepting who?